The RAF spots units of the Kriegsmarine steaming North towards Narvik and Trondheim loaded with troops and equipment. British war budget raises income tax. Great Britain severs diplomatic relations with Hungary. German troops capture Skopje in Macedonia forcing the Yugoslav forces to withdraw in the south of the country, which exposes the Greek flank. British promise allegiance to Yugoslavia. Derna is captured by the 5th Light Afrika Division along with Generals Neame and O’Connor later in the day. The U.S. Treasury lends 40,000 tons of silver to Electric Generator plants to replace copper being used in conductors; the copper will be used for military production instead. After 4 days of desperate fighting on Bataan, the Japanese have managed to penetrate 4 miles in to the US-Filipino lines, bringing General Wainwright’s forces to the brink of collapse. Hitler spends the better part of four days at Klessheim Castle near Salzburg (which has recently been refurbished as a Nazi Party conference center and spa) alternately browbeating and cajoling Mussolini to keep Italy in the war. Concerned by Mussolini’s evaporating morale, Hitler spends the rest of April summoning to Klessheim the leaders Vichy France, Norway, Bulgaria, Hungary, Romania, Slovakia and Croatia for a series of pep talks. With the war’s tide clearly turning against the Axis, the Fuhrer has limited success. Eighth Army joins up with the U.S. 2nd Corps in central Tunisia, while the British First Army makes progress in the North forming a solid line against the German army. The Japanese air force begins a 10-day, round-the-clock bombing offensive against US shipping in the Solomon’s. Goebbels takes overall control of Berlin. Two Jewish inmates escape from Auschwitz-Birkenau and make it safely to Czechoslovakia. One of them, Rudolf Vrba, submits a report to the Papal Nuncio in Slovakia which is forwarded to the Vatican. The U.S. First Army takes G0ttingen, 25 miles Northeast of Kassel. The US Ninth Army captures Hameln and Eisenach. Army Group Centre under General Schorner continues with its attacks against the 2nd and 4th Ukrainian front. In Yugoslavia, German Army Group E under General Lohr evacuates it remaining troops from Sarajevo. 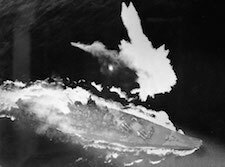 The battle of East China Sea begins as U.S. aircraft from Task Force 58 sink the Japanese super-battleship Yamato in a three-hour battle, 60 miles to the Southeast of Japan. Japanese casualties are reported as 2,488 sailors killed, four destroyers sunk, 58 aircraft destroyed. US Third Army finds Nazi art and gold stash in salt mine in Merkers worth $500 million. B29s fly their first fighter-escorted mission against Japan with P-51 Mustangs based on Iwo Jima.